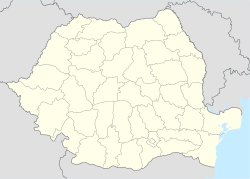 Cergău (German: Schergied; Hungarian: Cserged) is a commune located in Alba County, Romania. It has a population of 1,747 and is composed of three villages: Cergău Mare (the commune centre; Magyarcserged), Cergău Mic (Bolgárcserged) and Lupu (Farkastelke). Circular phalera having the representation of a horseman with shield. Part of the Dacian Silver Hoard of Lupu, 1st century BC. Found at Lupu in 1978. It has military and religious significance, being a representation of a God of War, possibly related to the Thracian Rider. The village of Cergău Mic was first mentioned in 1303 as Bolgarchergewd and in 1306 as Chergeod Bulgaricum. The first reference is the earliest evidence to the presence of the village's Bulgarian population. The prevalent theory is that Bulgarians arrived as refugees from the Vidin region (in modern northwest Bulgaria) and possibly from the Svishtov region (north central Bulgaria). These groups were originally of the Bogomil and Paulician sects respectively and were subject to religious persecution by the Eastern Orthodox authorities of the Second Bulgarian Empire. With their settlement in Transylvania, the Bulgarians of Cergău Mic adopted Roman Catholicism and subsequently Protestantism (Lutheranism) because they regarded these confessions as closest to their original beliefs among the denominations tolerated in Transylvania. As late as 1995, researcher Todor Balkanski reports that many of the locals were eager to identify as Bulgarians, even though they had undergone a complete language shift from Bulgarian to Romanian. The name "Şchei", an old Romanian ethnonym for Bulgarian people, was also in widespread use as a self-identifier, its meaning equated to "Bulgarian" by the locals. In 1995, a 75-year-old local, Linca Secel, was able to recite two prayers in a Bulgarian dialect by heart, with no understanding of the meaning. With some differences, one of the prayers was also recorded by Lyubomir Miletich in 1896 and by Ion Muşlea in 1927. The gradual linguistic Romanianization of the Bulgarians in Cergău Mic is attested in 1808 with the first reference to the modern Romanian name of the village, Cergău Mic. In the 1930 census, the village had a population of 830, of whom 762 identified as Romanians, 58 as Gypsies, 8 as Germans, 2 as Hungarians and none as Bulgarians. Confessionally, 443 people were Lutheran, 351 Greek Catholic, 25 Baptist, 10 Orthodox and 1 Reformed. The historically Bulgarian population of Cergău Mic may be related to that of other historically Bulgarian villages in Transylvania proper, such as the commune centre Cergău Mare, Rusciori and Bungard in Sibiu County and the Șchei neighbourhood of Brașov. ^ (in Romanian) "Cergău", at the Erdélyi Magyar Adatbank's Recensământ 2002; Retrieved on April 15, 2016. ^ Heltmann, Heinz; Paul Binder (1993). Reiseführer Siebenbürgen [Travel Guide Transylvania] (in German). Thaur bei Innsbruck: Wort-u.-Welt-Verlag. p. 205. ISBN 9783853731338. ^ a b c d Балкански, Тодор (1996). Трансилванските (седмиградските) българи. Етнос. Език. Етнонимия. Ономастика. Просопографии [The Transylvanian (Sedmigradsko) Bulgarians. Ethnicity. Language. Ethnonymy. Onomastics. Prosopographies] (in Bulgarian). Велико Търново: ИК “Знак ‘94”. pp. 17–31. ISBN 9789548709163. ^ Recensământul general al populației României din 29 Decemvrie 1930 (in Romanian). II. pp. 442, 742. Wikimedia Commons has media related to Cergău, Alba. Wikimedia Commons has media related to Lupu, Alba. Wikimedia Commons has media related to Dacian hoard of Lupu. This page was last edited on 10 November 2017, at 21:00 (UTC).